Town of Islip officials and Metropolitan Realty Associates President Joseph Farkas marked the opening of the 161,000-square-foot 300 Building at Sunrise Business Center in Great RIver Long Island with a ribbon cutting. Islip Town officials joined Joseph A. Farkas, president of Garden City-based Metropolitan Realty Associates LLC in a ribbon-cutting ceremony to mark the completion of a new 161,000-square-foot class-A office building at the Sunrise Business Center in Great River. "This is a very special day for my company and my partners at Angelo Gordon & Co. We are at 92 percent occupancy in tow of our buildings and we're ready to roll out the new 300 building." Farkas said at the ceremony marking the completion of the 300 Building at the 388,500-square-foot, three-building complex at 3500 Sunrise Hwy. The new building offers 161,000 square feet of class-A office space. The new office building was constructed at the site of a vacant electronics warehouse at the sprawling complex. Once enclosed by corrugated metal, the former warehouse has been re-skinned with a glass curtain wall and metal and glass panels, giving it a contemporary appearance. A second floor was added and, now, sunlight pours into the lobby's two-story, wood-paneled atrium entrance. The existing buildings, 50 percent vacant at the time Metropolitan and its partners acquired the complex three years ago, now are 92 percent leased. And, Farkas says, he is holding discussions with major tenants for the new space. "We've created and retained 850 jobs for Great River and the town of Islip. That's what real estate development is all about," Farkas said, predicting that the number of jobs in the complex could grow to 2,000 within the next 12 to 18 months. "It's not as far reaching as many people though" I'm proud of that." "I'm astounded that Metropolitan Realty Associates has brought these office facilities from 50 percent vacant to 92 percent rented in such a short time, and I'm excited to see how much more can be done and how many more jobs can be created by this project in Islip Town," Islip Town Supervisor Philip Nolan said in a statement. Among tenants at the complex are Netsmart Technologies, T-Mobile, Verizon, Metro Door, Aetna Life Insurance Co., A-C Tel, Hearst Business Media, Lessings Inc. Citizen's Bank, Schoenfeld Securities and the newest tenant, Suffolk County Department of Social Services Medicaid Division, which brings more than 100 new jobs to Great River. Farkas said he anticipates the new building can be leased as rapidly and credits a 15-year property-tax-abatement program provided by the Town of Islip's Industrial Development Agency for Sunrise's success as well as its location in an Empire Development Zone. "Our private/public partnership with the town has made this all possible," Nolan "is a tremendous supporter of this property," he added. "The objective of the Islip IDA was to preserve this site as a major employment center, providing good, sustainable job opportunities for Islip residents," said William Mannix, Islip Director of Economic Development. "Opening this newly renovated 300 Building is another positive step towards achieving that objective. It looks terrific and I can't wait until it's fully leased"
Joining Farkas and Mannix at the ground breaking were Islip Town Board members Christopher Bodkin and Steven Flotteron, Islip Planning Director Gene Murphy; Suffolk County IDA Chairman Jim Morgo, Adam Schwartz, managing director for real estate investments at Angelo, Gordon & Co, and Ronen Katz, an associate at Angelo Gordon. 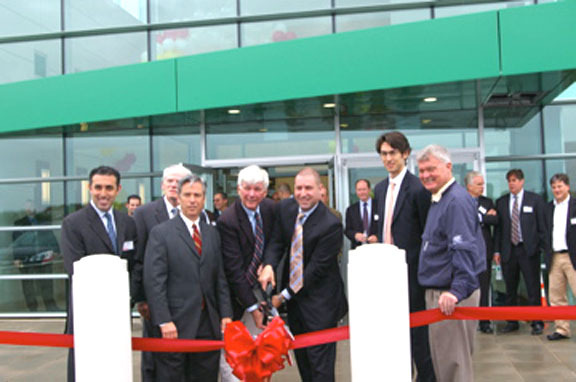 Salvatore A. Ferrara, president of East Meadow-based Combined Resources Consulting and Design Inc., was the architect of the new building. Woodbury-based Cameron Engineering provided mechanical, electrical, plumbing and structural engineering. Ambrosino Consulting Corp acted as Metropolitan's Construction Manager. Metropolitan's exclusive leasing team consists of Raymond Ruiz, Marianne Dugan, Brian Cruz, and Ryan Blaney, all of the CB Richard Ellis office in Woodbury. Located at the crossroads of Sunrise Highway and Connetquot Avenue, the Sunrise Business Center offers convenient access to major highways and is just minutes away from area colleges, the Central Islip court complex and Long Island MacArthur Airport. The complex offers a host of amenities, Empire Zone benefits and access to public transportation. "We provide first-class offices for companies large and small seeking value in today's challenging economic climate," Farkas said. Associates LLC is a national real estate investment and development firm, owning more than 700,000 square feet of office space on Long Island. Metropolitan Realty Associates owns the Business and Research Center at Garden City, in Garden City, NY, the Sunrise Business Center in Great River, NY, and the Jericho Atrium in Jericho, NY. It also owns The Southwest Corporate Center in Houston, TX and has important investments in development projects in many other properties across the country. For more information about Metropolitan Realty Associates visit http://www.metropolitanra.com.